Three weeks ago, I touched on five potential targets for the Pittsburgh Penguins as the trade deadline neared. The first name on that list was Justin Schultz. I can’t claim to have any inside information prior to Saturday’s trade, which brought Schultz to the Penguins in exchange for a third round pick. I can only say that the move made too much sense. Most continue to ask, wasn’t he terrible in Edmonton? To some degree, yes he was. However, he was also a young defender in a pretty bad situation, playing for an organization with a losing culture for as long as many of us can remember. When you look at the Oilers’ success rate with developing not only defensemen but young players in general, did he ever really stand a chance? Schultz truly is a reclamation project in Pittsburgh and one that is totally worth the gamble of a third round pick. Of course, Pittsburgh doesn’t have the best track record with developing youth in recent years either, so it’ll be interesting to see if that trend is altered now that we’ve passed the Ray Shero and Dan Bylsma era. With Schultz, Derrick Pouliot, Daniel Sprong, Dominik Simon and even those that we’ve seen more of recently like Tom Kuhnhackl, Bryan Rust, Scott Wilson and Conor Sheary, the future isn’t all that grim any longer. As long as Pittsburgh handles them correctly. Jim Rutherford, at least from the sound of things, isn’t done perusing the market for possible upgrades. Consider the following statement from head coach Mike Sullivan. Sullivan: Plotnikov held out of practice as a precaution related to the trade deadline. Sergei Plotnikov has been a disappointment in Pittsburgh. That doesn’t mean he isn’t a good hockey player, though. In fact, if you pay attention to analytics and underlying numbers, they show that Plotnikov is a possession driving machine. Unfortunately for him, he hasn’t been able to find his scoring touch yet and no longer fits in Sullivan’s uptempo system. The Penguins are trying to move him prior to tomorrow’s deadline and just might find a suitor. He’s a big body that plays well on the forecheck and in tough areas, and comes with a very inexpensive price tag. Plus, he’s a restricted free agent at season’s end, which gives his employer a ton of control over his next contract. There’s long-term value here, especially for a Western Conference team that plays a more suitable style for him. Personally, I expect that he’ll be moving on before all is said and done tomorrow. Another intriguing situation to keep an eye on is Pittsburgh’s goaltenders. 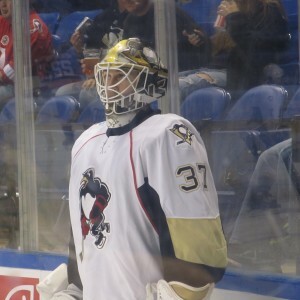 Yesterday, the team recalled AHL standout Matt Murray and currently have three goalies rostered. With a looming deadline, which normally means wanting as much salary cap flexibility as possible, why have all three with the big club? It has been rumored that Jeff Zatkoff could be moved for a few weeks. Penguins’ fans have been extremely unhappy with his play but when compared to other backups around the league, he’s on par with most. Could he also be on the move? It’s tough to gauge what kind of return Zatkoff would fetch. At 28 years old, it’s clear that he has reached his ceiling as an AHL starter or NHL backup. There are teams that are in desperate need of a backup goalie. If the Penguins can recoup any sort of draft pick in exchange for Zatkoff, I imagine Rutherford will pull the trigger. I don’t think it’s out of the question to do so. We could see a packaged deal with Plotnikov and Zatkoff in exchange for a pick or two. Pittsburgh would be perfectly happy with that return. The two dreaded terms for faithful Penguins fans, due to years of mortgaging the future for a “win now” attitude. Unfortunately, the Penguins haven’t won, despite all of those forfeited picks and prospects. This season will likely be different, at least according to Rutherford’s recent statements about being more careful with this organization’s youth. He did move a third round pick in the Schultz trade, but it was for a player that can potentially help past this season. If he reaches his potential here, the deal will seem like highway robbery. Past that, Pittsburgh is in pretty decent shape for the 2016 draft but could easily find themselves doing more watching than drafting again. Unless Rutherford sees a deal that could potentially move the needle on competing for a Stanley Cup, I don’t foresee much movement that doesn’t include another draft pick coming back to Pittsburgh. According to ESPN’s draft pick listing, the Penguins hold two second round picks (one from Anaheim), then a fourth, fifth, and sixth round selection. So, five draft picks in all. There are names out there that could warrant draft picks. Tanner Pearson, Kerby Rychel, Brandon Pirri and of course, Jonathan Drouin are all highly touted youngsters that might be available. I wouldn’t look for any draft picks being spent on rentals, though. Thanks for reading. Follow me on Twitter at @Michael29Angelo for more conversation around the Pittsburgh Penguins and everything NHL.